Patients with atrioventricular nodal reentry tachycardia (AVNRT) often are managed successfully by ablation of the slow pathway with success rates reported as high as 99%. Low voltage bridges (LVBs) have been demonstrated to be helpful in guiding AVNRT ablation. Patients may present to the electrophysiology lab without evidence of inducible arrhythmia. In these scenarios, the demonstration of LVBs may be diagnostic and guide catheter ablation treatment. The purpose of our study was to prospectively investigate the specificity of LVBs as a diagnostic marker of AVNRT. 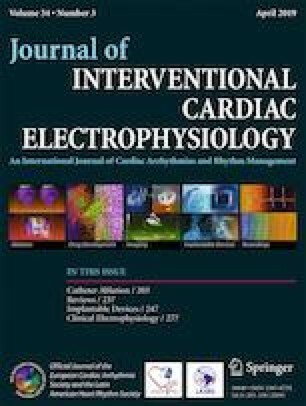 Patients aged < 19 years with narrow complex tachycardia prospectively underwent electrophysiology study with intention to perform catheter ablation. In each patient, the primary objective was the collection of right atrial voltage data that was then used to identify LVBs. Twenty-four patients were included after exclusion criteria were applied. Final diagnosis was 11 AVNRT and 13 non-AVNRT (nAVNRT). LVBs were identified in 11/11 AVNRT patients and 9/13 non-AVNRT patients (p = 0.09). LVBs are not specific to patients with AVNRT and cannot solely be used for diagnosis. However, in patients with documented AVNRT, the LVB can be used to identify the location of the slow pathway. The authors would like to thank St. Jude Medical/Abbott for their generous donation of catheters to complete this study.